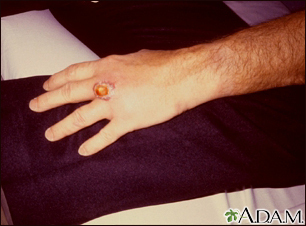 This lesion was produced by the bite of a brown recluse spider. The brown recluse is one of two common spiders in the United States considered venomous. (The other is the black widow.) However, the hobo spider, wolf spider, and jumping spider can also produce bites that require medical attention.